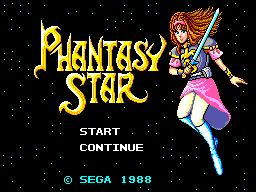 Phantasy Star, which began Sega's epic RPG series and is on its own half the reason to buy a Master System. Explore three planets with wildly differing climates, and wildly similar dungeons. Items "M SYSTEM" and "ZILLION" exist in the list of items and can be added to the inventory via save editing, but do not appear to have any effect. They are likely a reference to the Sega Master System and the game Zillion, respectively. The following phrase is found in the ROM at 0x807. Several items got renamed between the Japanese and international versions. 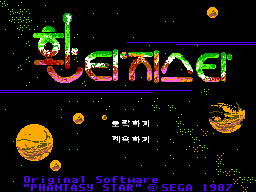 The Korean version featured a radically different title screen, removing Alis in favor of a more generic space scene. The rest of the game is apparently unchanged, other than the translation. 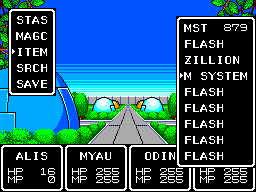 In the original English-language release, the Governor tells you "IN THE MAHARU CAVE LIVES AN ESPER NAMED NOAH. I WILL GIVE YOU A LETTER OF INTRODUCTION TO PRESENT TO HER", though Noah is listed as a male everywhere else. The GBA Phantasy Star Collection release changed this, using the pronoun "HIM". Like its Genesis sequel, the Virtual Console version of this game contains a plaintext, commented ASM patch. It basically removes every instance of a red cross in hospitals throughout the game. See the notes page for the raw patch code. This page was last modified on 6 July 2017, at 23:49.